GIVING KIDS CONDOMS doesn't promote promiscuity. Providing welfare benefits for unwed mothers doesn't encourage illegitimacy. And distributing needles to addicts has no impact on drug use. Liberals have abolished cause and effect. On April 20, Health and Human Services Secretary Donna Shalala announced that the administration will not lift the ban on federal funding of needle-exchange programs (NEPs). Congress had loudly threatened to reinstate the ban, if Shalala lifted it, and the president's own drug czar fought the move. Then, as a statement of idoelogical commitment, the secretary declared that while federal money won't be available, NEPs are an effective way to fight AIDS and don't encourage addiction. Sure, and they also build strong bodies in 12 ways and are clinically proven to fight cavities. Three days later, billionaire George Soros stepped forward to fill the void, offering $1 million of his own money to underwrite these lethal projects. Needle-exchange programs are part of the stealth campaign for drug legalization, a point we will return to shortly. That aside, how effective are they? Very -- if the goal is to give the Golden Triangle a full-employment economy. James L. Curtis, a professor of psychiatry and director of addiction services at the Harlem Hospital Center, calls NEPs "simplistic nonsense that stands common sense on its head." Curtis warns that the exchanges "hurt not only individual addicts but also poor and minority communities." Vancouver, Canada, has the largest needle give-away program in North America. Two million syringes are distributed each year. Since the program started in 1988, HIV prevalence among intravenous drug users has gone from 1 to 2 percent to 23 percent and deaths from drug overdoses have increased five-fold, giving Vancouver the highest heroin death rate in the United States and Canada. In a Montreal study, 39 percent of those who participated in its needle-exchange reported sharing dirty needles, compared to 38 percent of non-participants. NEPs promote the spread of AIDS by promoting addiction. The addicts who gather for syringe swaps network and learn where to acquire new supplies. By cutting the time it takes them to get drugs, NEPs increase drug use. Since police are ordered not to harass addicts at the exchanges, the sites become safe zones for the sale and use of narcotics. In many of the more than 100 NEPs in America, user are given a variety of additional paraphernalia, like pans for cooking heroin. At Baltimore's NEP, consumers receive a pamphlet, "Shoot Smart, Shoot Safe: Tips for Safer Crack Injection," illustrated with photos of needles being jabbed into veins. What better use for our tax dollars? Soros' support for needle-exchange programs establishes a crucial link between NEPs and the legalization lobby. Former Health, Education and Welfare Secretary Joseph Califano calls the financier the "Daddy Warbucks of drug legalization." In the past decade, Soros has given more than $20 million to change American drug policy. This includes millions poured into so-called medical marijuana initiatives in California, Arizona and Washington state. He's also bestowed $6.4 million on the Drug Policy Foundation (a legalization think tank) and given $4 million to its parent group, the Lindesmith Center, which he founded. To head Lindesmith, Soros chose Ethan Nadelmann, whose January 1998 article in Foreign Affairs calls for making needles available through public vending machines and heroin distribution to addicts. In the name of compassion, medical marijuana and needle exchanges are back doors to legalization. The idea is to legitimize addiction by getting government involved in various ways, such as subsidizing needle distribution and certifying pot as a palliative. Not surprisingly, the biggest boosters of NEPs are also the most enthusiastic legalizers -- besides Soros, former Surgeon General Jocelyn Elders, Baltimore Mayor Kurt Schmoke and the ACLU's Ira Glasser. Heroin use among teens doubled between 1991 and 1996. In San Francisco, site of another NEP, hospital admissions for heroin increased 66 percent from 1986 to 1995. 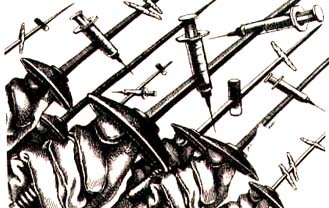 Needle-exchange programs are a form of assisted suicide -- another of Soros' pet causes for the betterment of humanity. It would be cheaper to just give addicts .38s and ammo, along with instructions on how to safely blow their brains out. The effect is the same.